Abzu is an underwater adventure video game that brings you various marine animals, plants and monuments. In our beginner's guide we will show you how you can move through the levels, what can be discovered underwater and how you can find collectable objects. 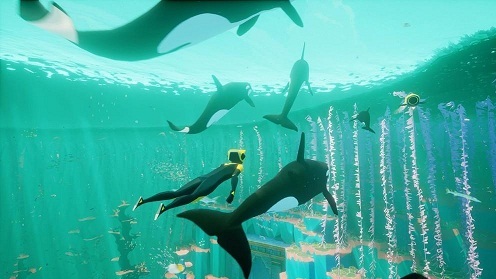 It is not much explained in Abzu and many of the game mechanics you have to discover for yourself. Therefore, in this guide we give you spoiler-free tips. Use the drawings on the wall at the shrine so that you will be able to learn more about the game's story. Also note that you never run out of air underwater. So you can explore as long as you want. Underwater you dive and move with the R2 button and simultaneously you can select the direction with the left analog stick. After a while you will become slow and must hold R2 to gain the speed back again. When you get close to a fish you can press the L2 button to hold to it. Although you no longer have the direct control on the direction, but can move faster. You can trigger a boost diving by pressing the X button and that allows you to move five seconds faster. However, the game doesn’t explain that you can also trigger a stronger boost, with that you can move through the areas twice as fast. This you recognize the golden glow of the fins at the Super-Boost. To trigger it, you have to press the X-button three times. Suppressed once, and after half a second for a second time. Then press the X button a third time during the boost is still active. You can even trigger the Super-Boost repeatedly if you loose the pace. You activate your scanner with square button that shows you important opportunities for interaction in the area. These include collectable objects, open doors or get robots and eliminate the coral walls. If you are not sure whether you are in the right area for interaction, you can also press the square button vigorously in order not to miss anything. Fishes are used as a guide and normally go wherever your goal is. Some fish swim toward hidden coral reefs with collectibles. The fish are practically as orientation especially in larger and open areas. You will quickly get from A to B, just floating out where a lot of fishes are there. Relevant places recognize from a distance and to their outlines. Look carefully to find elevated points and search your environment to direct path. Also color differences help with orientation. Hold for places that are lighter or darker than the rest of the environment. In Abzu, there is no time pressure and you will not get die. So enjoy the game and take your time. It can happen sometimes that you exceed a certain point on the way and no longer can return to the previous area. These points are clearly emphasized by the game. Mostly they then pass through a large entrance. So take your time to explore all areas and don’t miss anything. In Abzu there are three types of collectibles, which are important for trophies. - Shells can be found usually on the deeply located points of each zone in the game. Here they hidden in corners. - Meditation Statues are usually easy to spot in open areas. Want to know how many statues you have already discovered? You can see this on the appropriate menu item in the main menu. This you unlock after you found your first statue.